The legendary Mexican icons Panteón Rococó will be performing tonight at Flamingo Cantina as part of their nationwide tour. Despite being from Mexico City, Panteón Rococó is signed to a German label, Ubersee Records. They have sold thousands of records over their long career and have spent many of them touring all over Europe. While a lot of their music is poilitical, many of their songs are some of the best love songs you’ll hear. Panteón Rococó blends elemensts of ska, reggae, Latin and even soul. They are known for having one of the most prolific live shows in music. Fans of groups such as Los Skarnales or Maldita Vecindad would love Panteón Rococó. 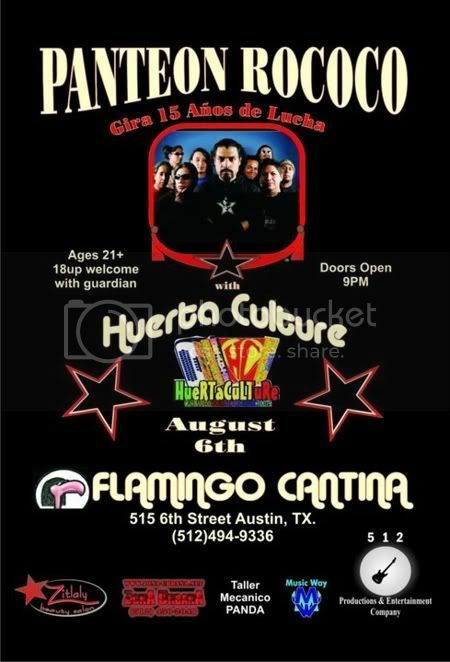 Local support comes from Austin’s own Huerta Culture, which you can learn about on Austin Vida here. Tickets are $30. Doors open at 9 p.m. Ages 21+ welcome, or 18+ with a gaurdian. Tickets are available only at the door. Early arrival is strongly recommended.